Hope you all had a great week :) I'm so ready for the weekend woohoooo TGIF!!!!!! With the end of the week we have another Twinsie Friday YAY!!!! 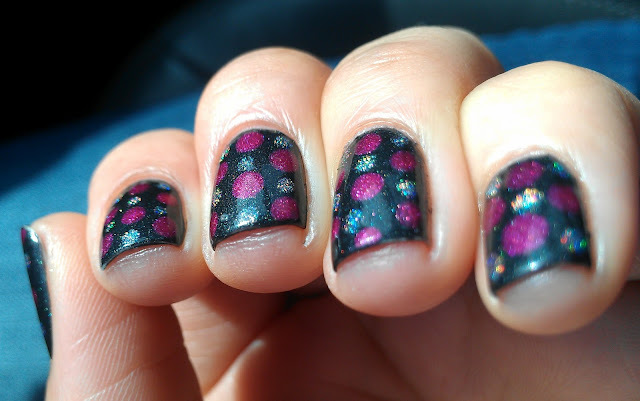 I have been seeing a lot of dots lately, and I mean polka dot manis :-P so I suggested we do a polka dot mani for today. Now that I am done with all my advertising LOL, hope you all have a great weekend!! This looks fabulous - I really want to try it! I love this!!! Such a great combo of colors! And I'm with you, those holo dots are amazing. Your nails are very delicate. 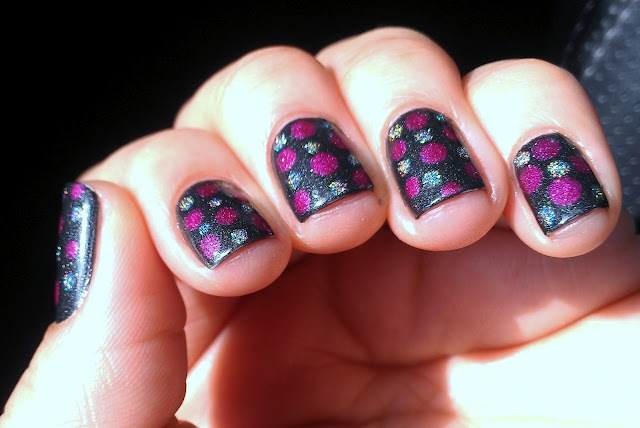 aww your shorties look super girly with this mani!! and seriously, we both did black and matte? no wonder we're twinsies! hhahahaa i hope people realize we dont show each others manis until the day of . lol and lesbihonest i just want lesbihonest because of the name! hahaha you did great amiga i love all your pics but wth! where is your assistants POTD ?! OH MY GOD! Those holo dots are AMAZING!! 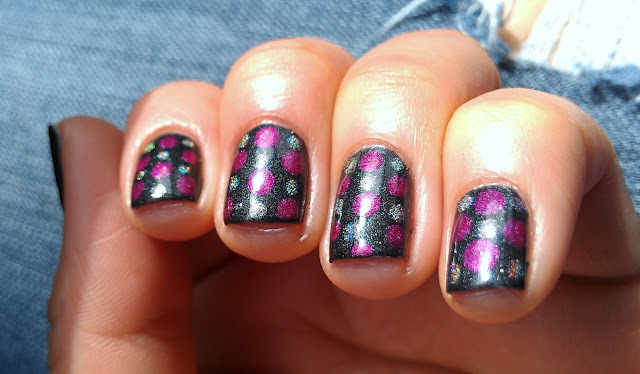 gorgeous mani!! That looks amazing!!!!! Drooling over here..lol! This is awesome!!! I am loving this!! I LOVE it matte! I can't help but be addicted to the way matte looks! so cute! love it, your pictures are always so clean and crisp so i dont mind seeing many off them, ive been really wanting some manglaze polishes too, and this is not helping. Soooo pretty! I love it with topcoat, the shimmer in all of those polishes is awesome. It has turned out to be gorgeoues...lesbihonest is one colour I have been drooling over for quite some time!! Wow I love the holo dots too! They look so interesting! Oh wow. Lovely polishes and you've created a gorgeous mani with them!